Strengthening sales into the professional market boosted overall growth in the EMEA PC sector during the first quarter of 2012, according to Gartner's preliminary figures. Total shipments into the region of 28.2 million units were up 6.7% on the same period last year, the analyst house revealed. Strengthening sales into the professional market boosted overall growth in the EMEA PC sector during the first quarter of 2012, according to Gartner's preliminary figures. Total shipments into the region of 28.2 million units were up 6.7% on the same period last year, the analyst house revealed. Worldwide shipments of 89 million units were up just 1.9% thanks to a toxic combo of weakening sales in Asian markets and a worse than expected quarter for consumer sales, although there was less impact than one might expect from the HDD shortage, as low demand for PCs masked the tightened supply. Gartner research director Ranjit Atwal said that EMEA had seen "solid demand from the professional market" during Q1 "as organisations executed long-awaited Windows 7 plans." 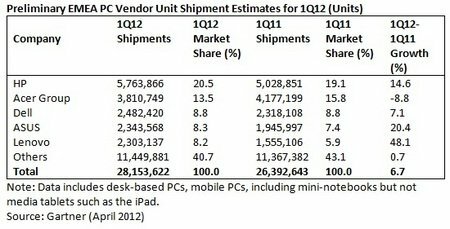 This reflected in stronger sales on desktop machines, which Gartner reckons will account for 40% of total PC shipments in 2012. "The desk-based PC isn't dead yet," Atwal remarked. Although the market performed well, it should be noted that this was in comparison with a very weak 2011, Gartner pointed out. As Gartner's data reveal (see table below), there was no change in the ranking of the top five vendors in EMEA. HP consolidated its number one spot with growth of 14.6% year-on-year, while Acer's inventory woes of a year ago saw it shrink by 8.8%, although it maintained overall second place. It was Lenovo, however, that turned in the most impressive regional performance, growing close to 50% with solid increases on both its desktop and mobile PC lines. Worldwide, HP, Lenovo and Dell held the top spots, with Acer and ASUS trailing in fourth and fifth position respectively.